Can't find a venue for your wedding or party? 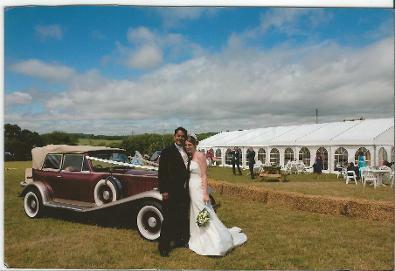 Find out about having your event at Duckaller Farm. Find out about the crops we grow and how we grow them, and discover what wildlife can be found on the farm. Keith and Roz moved to Duckaller Farm in March 1987. Some 18 months later saw the arrival of the first pigs, followed the next day by their eldest son Sam. Since that time there have always been pigs at the farm in varying quantities as an integral part of the rotation. They provide fertility and organic matter to the soil and clear the ground of previous crops and weeds. The pigs have always been free range (sometimes too free range! ), being kept outdoors for the whole of their time on the farm. Even the sows have their litters in the field and suckle them until they are ready for solid food. At the peak, Duckaller Farm was home to more than 250 sows, 25 boars and up to 500 piglets of various ages on the farm. In November 1999, after 2 years of exceptionally low prices and negative returns, the entire herd was sold only keeping back half a dozen sows. This coincided with the farm converting to organic production. As part of the conversion process parts of the farm were included in the Countryside Stewardship Scheme, now Higher Level Stewardship (HLS). The scheme's objective is to enhance the local environment. Over the years crops grown included lupins and barley to be mixed into pig feed, cauliflowers and onions, leeks, Jerusalem artichokes, parsnips, broccoli and potatoes for Riverford Organics. During this time, the first Berkshire pigs arrived on the farm. Duckaller Farm converted back to conventional farming after 10 years of being organic due to the lack of premium available for products being sold.